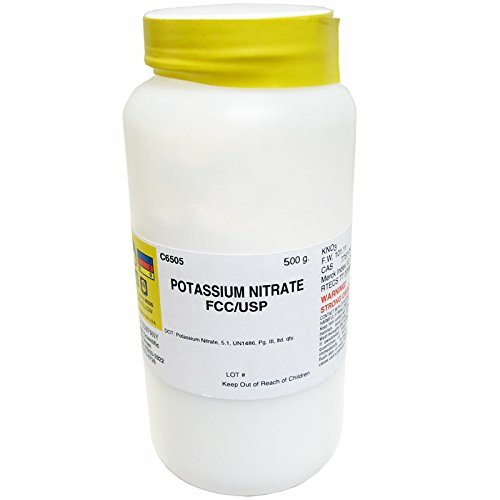 Science Company food grade Potassium Nitrate is safely used in meat curing (corned beef) for color stabilization. It appears as a fine, crystalline powder. Other uses include pyrotechnics, rocket ignition compounds, self activating incense, and tree stump remover. It is one of the three components of black powder, along with powdered charcoal (substantially carbon) and sulfur, where it acts as an oxidizer. Commercial uses include specialty fertilizer, glass manufacturing, and tempering steel. Choose The Science Company brand for meat curing applications. If you have any questions about this product by The Science Company, contact us by completing and submitting the form below. If you are looking for a specif part number, please include it with your message.